Pam Holland Designs and Productions: Portraits. No 1. This is the pen drawing I made for this portrait. There is much more to it and I won't reveal the real picture until the portrait is completed. I have traced the image from a photo onto a good quality tracing paper. As you can see, I have made image pieces from the blocks of color. By image pieces I mean an individual stand alone appliqué piece. The next step is to simplify the work. As you can see there are lots of pieces in this portrait... I don't trace each individual piece onto fusible web to begin with, it gets too confusing. I work step by step. The image you see below is the reversed image. The tracing paper turned over. So I am looking at the back of the drawn image. 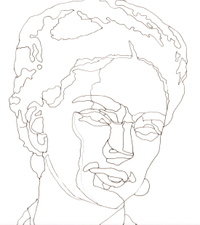 I will trace the face and the neck onto fusible web first.